Image caption One of al-Watan's cartoons says: "Western glasses for the Islamic world"
An Egyptian newspaper has launched a campaign against the obscene cartoons of the Prophet Muhammad published by the French magazine, Charlie Hebdo. Al-Watan, a secular daily, published 13 cartoons on Monday under the slogan "Fight cartoons with cartoons". 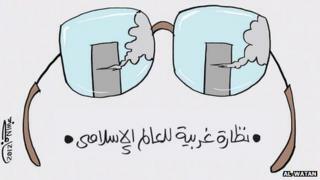 One shows a pair of glasses through which the burning World Trade Center is seen, with the caption: "Western glasses for the Islamic world". Charlie Hebdo's cartoons played on the uproar over a video which mocks Islam. Some 50 people have died in violent protests which erupted two weeks ago over the amateur film, Innocence of Muslims. The satirical cartoons published by Charlie Hebdo drew a small group of protesters to the French Embassy in Cairo on Friday, although elsewhere in the Muslim world protests against them and Innocence of Muslims became large-scale and violent. Al-Watan's two-page spread of cartoons was published as part of a 12-page dedicated section responding to Charlie Hebdo. The section also included articles by well-known secular writers, such as former Carnegie Middle East Centre research director Amr Hamzawi, and prominent Egyptian Islamic scholars and preachers, such as the Grand Mufti of Egypt, Ali Gomaa. The cartoons included one showing a white man accusing an angry, bearded man of being a terrorist until he sees he is from Israel and offers him a flower instead. In another example, two images of Arab men appear side by side. One is wearing a hat and jacket and has a small beard; the other has a turban on his head and is baring his teeth through a long beard, while carrying a bloodied knife. A torch with the American flag for a handle is pointed at the image of the man with the knife. Readers of al-Watan, which is critical of the Islamist Muslim Brotherhood of President Mohammed Mursi, reacted positively to the supplement, with some leaving comments on its website praising the idea of confronting "thought with thought" and thanking the paper for its "civilised response."